New York, New York - Magzter, the world's largest digital magazine newsstand, has now crossed 50 million downloads, which is a phenomenal achievement by any yardstick. This humongous feat has become possible due to Magzter's consistent efforts in introducing innovative new features every month to attract new users across the globe. In addition to Magzter's iOS and Android apps, Magzter also powers more than 7,000 magazine apps of renowned publishers on App Store and Google Play. Magzter's catalog of 10,500+ magazines from 4,000+ publishers is undoubtedly the largest and most diverse collection, which spreads across 40+ categories and 60+ languages. While a recent study revealed that fake news spreads 70% more quickly on social media, it has become extremely difficult for the common man to identify and neglect such misleading information. Magzter brings together more than 10,500 trusted sources of content from 50+ countries including the USA, UK, Canada, India, Singapore, Australia, South Africa, Spain, Mexico, Philippines, and Turkey, thereby acting as the one-stop solution for keeping people updated on all the latest happenings across the globe. Magzter ensures that its users get timely information on their favorite topics from the most renowned and dependable sources, which ultimately saves the time and energy of users. Magzter started curating articles from best-selling magazines couple of years back, and it became an instant hit among the readers. Soon after launching articles, Magzter introduced ezRead 2.0, which presented magazine pages in responsive layouts that are automatically optimized for any size screen - smartphones as well as tablets. Magzter GOLD, the 'All-You-Can-Read' subscription model which offers unlimited access to 5,000 magazines and premium articles at one low price, has been attracting thousands of new readers every month. Magzter has also been conducting exciting contests to motivate more readers to take up digital reading. Such innovative strategies from Magzter have been instrumental in crossing the 50 million download mark. With its latest GPS-based offering, Smart Reading Zone, which provides unlimited access to thousands of best-selling magazines and curated premium articles for any location instantly, Magzter is increasingly becoming the preferred digital reading partner of hundreds of airports, hotels, restaurants, malls, clubs, libraries, corporates, educational institutions, and other commercial entities. By encouraging millions of people to read digitally, Magzter has so far saved 221,000 trees and other natural resources, thereby playing an active role in fostering green revolution. "At Magzter, it has been a dream journey so far for us and I would like to extend my heartfelt thanks to our publishers, users and other strategic partners, who have been offering their unflinching support to us over the years. Kudos to the team at Magzter for giving their best every single day, without which this feat could not have been achieved! There are more than 1.5 Billion readers who still consume print magazines globally and we believe Magzter will be their reading destination of choice as they look for digital reading options." - Girish Ramdas, CEO, Magzter Inc.
"We are ecstatic to know that we are trusted by over 50 million users across the world to fulfill their reading needs. This feat has increased our responsibility and we will continue to push our boundaries to take Magzter to new audiences and geographies. We are quite confident that we will the hit the 100 million user mark soon." - Vijay Radhakrishnan, President, Magzter Inc.
Magzter - Digital Magazine Newsstand 7.5 is free (with in-app purchases) and available worldwide through the App Store in the News category. The Magzter app is also available on the web, Google Play and is expanding to more platforms soon. Magzter's easy purchase and renewal systems ensure subscriptions are paid on time, eliminating the need for paper checks and postal mail issues. Users can buy their magazines on any of the above devices/platforms and seamlessly port their purchases to any other devices, a feature unique to Magzter. Magzter is the world's largest and fastest growing global digital magazine newsstand with over 50 million digital consumers, more than 10,500 magazines from over 4,000 publishers. Headquartered in New York, Magzter has its local offices in London, Barcelona, Amsterdam, Mexico City, Cape Town, Chennai, Singapore and Tokyo and will soon be expanding to other countries. 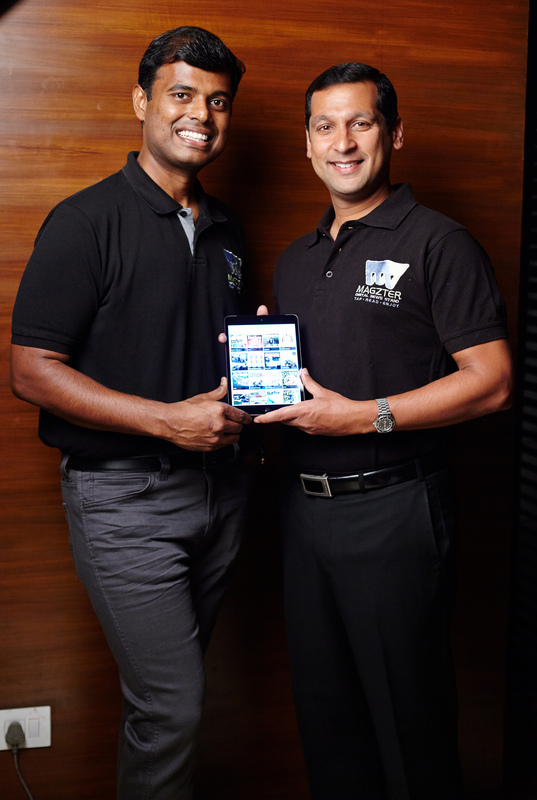 Founded by global entrepreneurs, Girish Ramdas and Vijay Radhakrishnan in June 2011, Magzter enables magazine publishers around the world to create and deliver digital editions of their titles to global consumers. Powered by its proprietary OREY Click Publishing System(R), Magzter also enables their customers to publish interactive/audio-visual content in the magazine as it supports HTML5. Magzter launched Magzter GOLD subscription service to give digital readers unlimited access to thousands of magazines for a low monthly price. All Material and Software (C) Copyright 2018 Magzter Inc. All Rights Reserved. Apple, the Apple logo, iPhone, iPod, and iPad are registered trademarks of Apple Inc. in the U.S. and/or other countries. Other trademarks and registered trademarks may be the property of their respective owners.